Private property is more than a “thing.” Your body, your thoughts and your actions obtain for you the benefits of various things, but it is the relationship between you and those things that form the essence of private property. Our forebearers recognized the idea and the ideal that every individual possesses unalienable rights. When this idea is respected it provides great advantages to individuals and society. They recognize and elevate humans above all other species. They recognize that we each have a life that is our own. From this philosophical premise we create systems that enable personal achievement, improve society and allow one to pursue happiness. Many Californians have fallen for the collectivist form of societal organization. 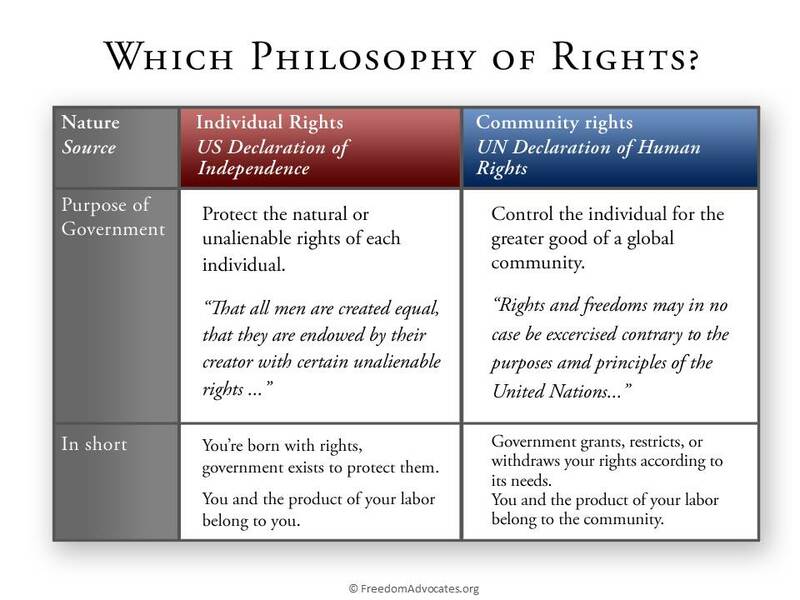 Under collectivism, individual unalienable rights are abridged for the “common good”. Ultimately, individual rights are abolished under the law. All things fall under the control of “society”. In practice this requires that collectivist societies rule by force. This almost always leads to rule of an individual or a small group with unlimited power. They decide the “common good”. The creation of a global collectivist society is in full operation today. The collectivist society is currently being promoted in the open. It will be needed to enforce and maintain the new order. The time to fully implement the collectivist philosophy and enforce communitarian law is approaching. Promoters of social justice plan to replace the principles of equal justice under communitarian law. The globalist Sustainable program working goal is to restructure human nature. Restructured human nature is the central mission of their political–economic program. Globalist political-economics will be controlled by those in control of the high-tech police state. People with some knowledge and understanding of history and who remember freedom will long for the days when unalienable and individual rights were acknowledged and protected by government. Examples of the collectivist progression are readily seen in California politics. Organizers facilitate growing legions of mindless citizens to attack the rights of others. Their goal is to obtain and/or control what is not theirs. The reality of these examples shows us the process of America’s fall into the emerging global movement. There private property will be abolished. The globalist movement is well organized, financed and powerful. It operates using ‘global-to-local’ “Sustainability” programs. 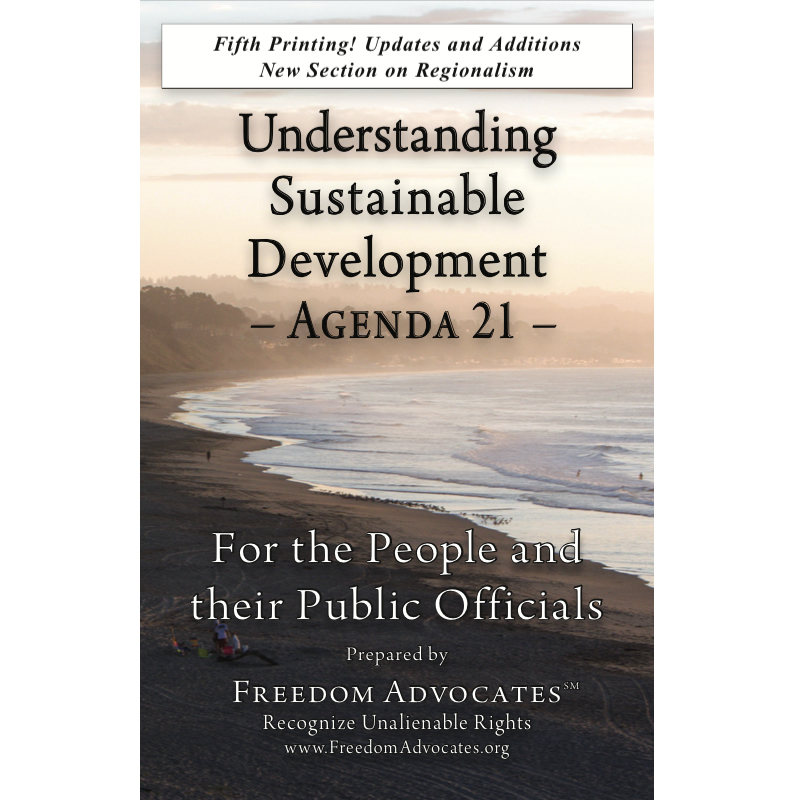 All you need do is track Sustainable Development policy in Every Town USA. Conform school curriculum to raise “global citizens”. Establish public transportation systems to oppose auto-mobility. Collectivize water, timber and other natural resources. Run roughshod over private land owners. Create government controlled “affordable housing” projects. Average Americans are growing aware of these issues. However, most fail to understand the full impact of what is happening. I strongly suggest they undertake a study of the idea and full meaning of “unalienable rights”. Americans need to recognize that America’s unique experience is the result of our Founder’s study and articulation of the principles underlying John Locke’s treatise explaining each individual’s unalienable right to his life, liberty and property. Unalienable: inherent to or imbued within our being – something which cannot be decreed away. Humans may have their natural or unalienable rights violated. But human beings are never separated from their unalienable rights. History shows that no society has acknowledged their citizen’s unalienable rights. This fact accounts for mankind’s greatest social travails. The United States is the only nation in world history to politically recognize the unalienable nature of these individual rights. This is why the Declaration of Independence is generally and properly recognized as mankind’s greatest achievement by earlier American generations. Life: That your life is your own. You manage and direct your life as you choose. Life is not to be dictated by ruling elite who seek to create batteries of rules to control every aspect of ordinary life. Liberty: The freedom of action incident to and necessary for making choices that result in leading one’s own life. Individual liberty necessitates a government with limited power. America is being directed toward a collectivist course change today. At the core, this change is driven by our nation’s lessening commitment to unalienable rights. Private property is being abolished step-by-step. With it will go liberty and for many, life itself. If we are to restore and preserve liberty and live in a society which respects individuals, we must confront the on-going assault on private property. When your failure to protect the rights of others will result in the loss of your rights. It is late in the war on liberty. It is time to commit and take action. Defend the idea of the right of the use and enjoyment of private property. Understand the nature of the global order’s attack upon unalienable rights. Work to preserve liberty.